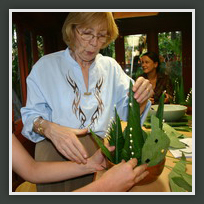 ORIGIN is a uniquely designed program for teaching the traditional arts of Thailand. 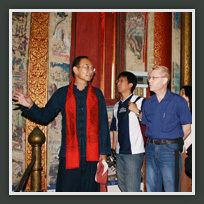 ORIGIN’s aim is to introduce the spiritual origins of Thailand’s art and culture. Through experience of these arts, visitors gain a set of “keys to unlock,” or “ways to look at” what they will see as they travel around the country. ORIGIN focuses on direct physical experience of the arts. 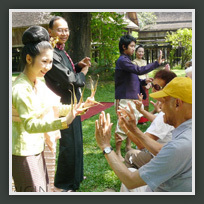 Participants learn the movements and gestures of dance, how to sit, walk, and wai (pay respect by raising the hands with palms together), make traditional flower offerings by folding banana leaves, draw classical patterns using gold leaf, cook classic cuisine, etc. At the same time, we provide background and cultural overview to put the arts into meaningful context. The usual ORIGIN program runs for a brief time - usually one day or half a day - but having the chance to physically practice these arts oneself, with clear explanation, shows one what to look for. For the rest of their trip, visitors will be unable to attend a dance or look at a painting or temple without recalling this experience. 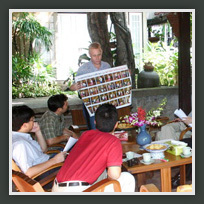 In Thailand, Origin has two centers, in Bangkok and in Chiangmai. 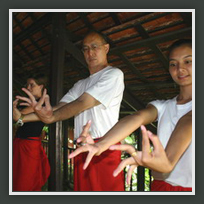 The programs in these two centers are very different: In Bangkok we focus on the classic arts of the Thai court such as Khon (classic masked dance), Etiquette, and Martial Arts. These arts trace back thousands of years to India, Java, and the Khmer empire at Angkor Wat, and were later brought to their present high level of refinement within the Thai court. In Chiangmai, we concentrate on the arts of Lanna, the old kingdom of Chiangmai. These are related to the ancient culture of the peoples of the Mekhong River valley, including the Lao, the Burmese, and ethnic groups of southern China and Vietnam. In contrast to the Bangkok arts, Lanna arts are more free, with roots in animism and shamanism.